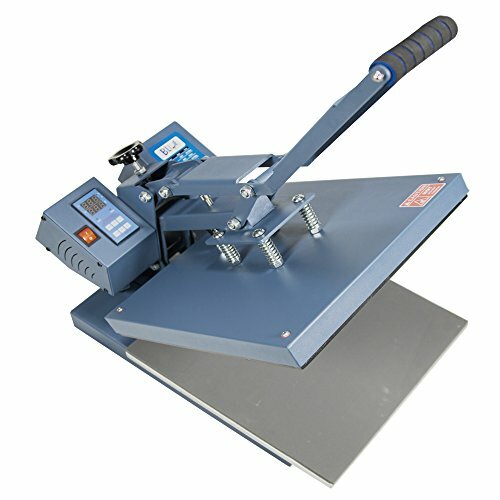 - Large 15" x 15" Platen - allows transfers onto many flat surfaced items, e.g. t-shirts, garments, bags, mouse pads, ceramic tiles, plates and much more. - Digital LCD display - Timer with an audible alarm when time is complete. - Heavy-duty - rigid steel frame that is built to last. - Non-stick coated element - Non-stick printing area to prevent scorching or sticking. - Hi-temp silicone pad - Removable and reversible for long lasting performance. - Excellent included instructions for operation. Working Table: 15" x 15"
If you have any questions about this product by USCutter, contact us by completing and submitting the form below. If you are looking for a specif part number, please include it with your message.